Dental implants have been successfully used for more than 30 years to replace a missing tooth or teeth, be it through an accident, decay or simply age. We know, whatever the reason, losing a tooth or teeth can be traumatic and have a significant impact on the rest of your life. Previously a bridge or dentures were the most popular ways to replace missing teeth. However, these prosthetic options can make eating uncomfortable or make people feel self-conscious of their smile. 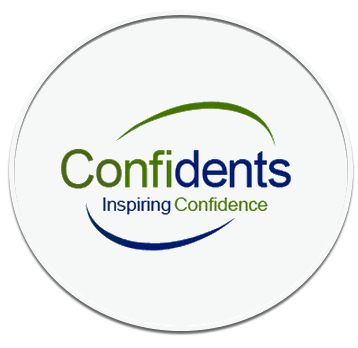 Confidents denture clinic is very proud to be working with the well respected Carl Horton who provides us with labour and expertise with dental implants. Advances in technology have made implants more accessible and they have become the favoured option to replace missing teeth. Overall, dental implants produce a more natural outcome, both aesthetically and functionally. Whether it’s through illness, an accident, a lack of dental care or age, Confidents Denture Clinic are here to help. For a free consultation, call us today on 0121 663 1190 or visit our new look surgery on 19 Albert Road, Harborne, Birmingham, B17 OAP and let us put your mind at ease. An implant effectively replaces the root of your tooth and is surgically inserted into the jaw. Made from titanium, a material that is compatible with your body, the implant easily integrates with your jawbone in a process called osseointegration, which takes between 6 and 12 weeks. After the healing process is complete, a crown, denture or bridge is placed on top of the implants and functions in the same way as natural teeth. Our denture expertise doesn’t stop at fitting your new dentures. We’ll be on hand to maintain your dentures and make sure they continue to fit comfortably for years to come. When the time comes for you to replace your dentures, you can be sure of getting the same high level of care and attention when we guide you through the new dentures and treatments. Did you know that providing you are orally fit - You can select a denture clinic of your choice. So why go anywhere else other than the leading practice in denture Birmingham. Our moulds fit perfectly, our surgery facilities the latest and our clinical dental technician is industry leading. Implants have been around for more than 30 years and are a safe and clinically proven technology. Implants have an integration success rate of up to 98 per cent, and if properly maintained will last for a considerable number of years, if not a lifetime. There is no set time and treatment will depend on a patient’s individual circumstances. Treatment can take as little as six weeks, but more complex treatment will take longer. Can implants replace missing teeth? It depends on the condition of the bone in your jaw. Your dentist will carry out several tests to find out how much bone is there, and if there’s not enough, or the bone isn’t healthy enough, some bone grafting may be required before implant treatment can go ahead.